Using my Tarot Deck and Guides I can answer two or more questions with insight. This reading is good for those with questions in different areas who don’t want a chat reading. Good for two, four or six questions. I begin each Tarot Card Reading by creating a sacred space. I have several decks of cards in which I use based on what messages I get from my Spirit Guides. When you mix the cards and focus on receiving guidance, you magnetize the specific energy of those cards that are attracted to your question. It then creates the powerful messages that your Higher Self wants you to hear. 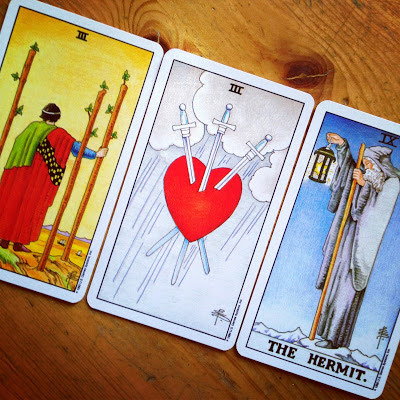 The purpose of a Tarot Card Reading is to bring clarity and direction into your daily life. I have many different spreads for different areas you may be needing guidance on. Please note: I am not a fortuneteller. Rather, I offer my clients spiritual healing and guidance based on the card messages. Furthermore, each of us has free will and is ultimately responsible for every choice we make. Finally, I assure each of my clients complete confidentiality. I will not break this trust under any circumstance. Also keep in mind that like all signs, Tarot Card Readings are merely pointers, guiding the seeker down the path to a loving and fulfilling life.